Ornithogalum dubium is one of over 180 species of Ornithogalum, all which feature gorgeous clusters of star-shaped florets gathered at the head of a long, leafless stem. 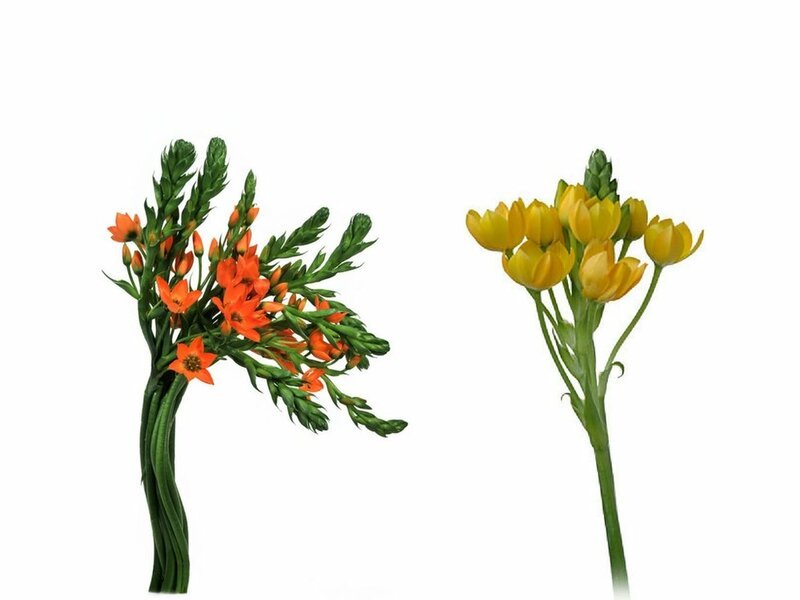 Dubium's star-shaped, silky florets most often come in hues of orange, yellow, and sometimes white, and bloom in stages all the way to the top of its flower head, a process which can take a few weeks. Other Names: Dubium, Snake Flower, Wonder Flower, and Sun Star. substitute for asparagus. Common relatives: onion, Alstroemeria, Hyacinth, Tulip and Star of Bethlehem. Dubium means "dubious" or "unlike others of the genus" in Latin, which may refer to its vibrant coloring.